Dr. Rosenberg serves as the Laboratory Director for Arthritis and Rheumatism Associates, P.C. and the Co-Director of the Osteoporosis Assessment Center. He is a Founding Fellow of the American College of Rheumatology and a member of the American College of Physicians. He is also a member of the Rheumatism Society of the District of Columbia where he has served as president. 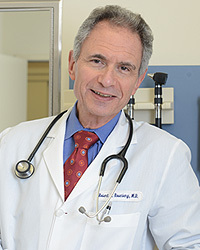 Dr. Rosenberg completed a seven year combined program at The George Washington University and The George Washington University School of Medicine where he received his M.D. in 1972. His Internship and first year of his Medicine Residency were at the University of Pittsburgh; he completed his Medical Residency and Rheumatology Fellowship at the University of Tennessee. Dr. Rosenberg has also served as an Epidemic Intelligence Service (EIS) Officer for the United States Public Health Service at the Centers for Disease Control in Atlanta, GA. He is Board Certified in Internal Medicine and Rheumatology and is proud of the recognition bestowed upon him by the medical community by being named an outstanding specialist in the field of Rheumatology by Washingtonian magazine and Best Doctors in America.